Grammy students rehearse for their final show. 1. 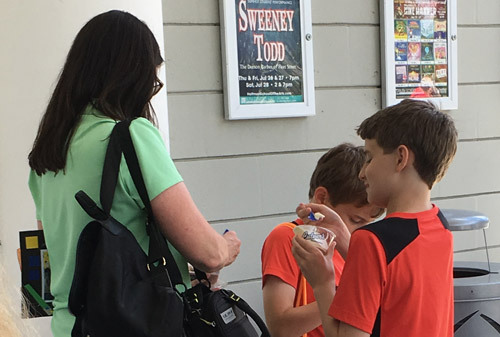 Creating characters and a script: On the first day of our week-long summer programs, students discuss creating characters with their teachers. They are tasked with either creating their own organic character or selecting one of their favorites to play in their class show. The next day, taking every student’s character into account, the class works with their teacher to write a script for a play. Thus, not only do students get to perform, but they also get to learn about the playwriting process along the way. It’s so much fun because each class’s show is totally unique and personal to its individual students! Students perform as beloved characters from Star Wars. 2. Faculty: Our Hoffman summer programs are taught by well-trained faculty members who have real experience with the arts. One of Donna Mastro’s, parent to student Graham Mastro, favorite parts of the program is the faculty: “The teachers and staff give everything they have in them to these young people. Our children are so happy because they are working so hard and growing in so many different ways alongside other amazing young people and their teachers to accomplish great things!” Our faculty work tirelessly to help their students create and rehearse a show they will be proud to perform. 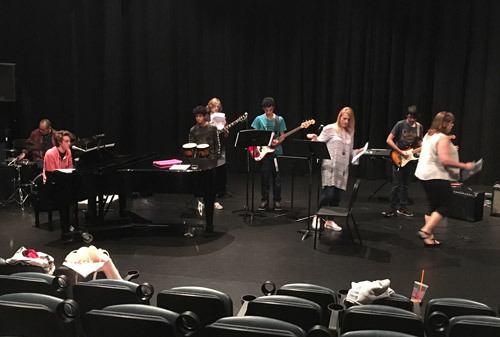 Grammy students (left) and Sweeney Todd students (right) rehearse for their final shows with their teachers. 3. Performing on the Murray stage: For the culminating performance at the end of the week, Hoffman students have the opportunity to share their work on the Murray stage, our black box theatre that visiting artists also come to perform on. Thus, our summer programs give students a chance to have a real, professional performance experience. Students rehearse on the Murray stage for their shows. 4. Making friends: Not only do students get to spend a week experiencing the arts, they also share their time with other children who have the same passions they do. Student Graham Mastro says that there were too many favorite memories from the summer to choose just one, but he comments on his peers, saying “The teachers and cast were top-notch. Everyone was so professional and fun to work with.” New friends and fun memories abound in a Hoffman summer program! Students share the stage with their classmates. 5. Performing for family and friends: One of the best aspects of theatre is the chance to share. The end of each week-long summer program culminates in a final performance of the classes’ original shows, and family and friends are invited to attend! Donna Mastro says, “It’s overwhelming to see everything they worked for during camp come together on stage. For me personally as a mother, the weekend of their performances was one of the best weekends of my life. The summer program at Marcia P. Hoffman School of the Arts has been like the rudder of a ship for our children, directing and molding our children for their future.” Family and friends will certainly be impressed by their students’ growth over the week! Left: Students perform for their friends and families. Right: Mother and daughter celebrate after a fabulous show. Bonus! Sweet treats: This summer, Culver’s sponsored our summer programs. After each performance, our students, families, and friends got to enjoy a frozen treat together to celebrate all of their hard work. Thank you Culver’s for providing the perfect way to end the week! Families enjoy a sweet treat from Culver’s after the show. There are certainly far more reasons why we love our Hoffman summer programs, but these are some of our favorites. We so enjoyed sharing laughs, memories, and—of course—a love of the arts with your children this summer. After a summer full of fun, we can’t wait for all that the new school year holds at the Marcia P. Hoffman School of the Arts! Interested in more information on classes and private lessons? Visit the Marcia P. Hoffman website today!